Zimbabwe cyclone survivors tearfully list dead relatives - SABC News - Breaking news, special reports, world, business, sport coverage of all South African current events. Africa's news leader. The Chimanimani community families started burying their dead in damp graves. Agony is etched in Tapiwa Chanyawo’s face as he tells of the night the storm came, a mudslide swept away their home, and his family died. Their home, in the eastern Zimbabwean town of Chimanimani, lay in the path of Idai, a gigantic tropical cyclone that may have left more than 1 000 dead in its wake. “My father, my mother, my two sisters including the elder one and her child, they all died,” Chanyawo told AFP from his bed at a local hospital, counting the numbers on his fingers. His family was among 98 confirmed dead in Zimbabwe. At least 217 more are missing and 44 stranded, according to the information ministry. The storm struck overnight on Friday after it first smashed into central Mozambique, whose president, Filipe Nyusi, said on Monday that at least 1 0000 people there may have perished. More than 100 houses in Ngangu township in Chimanimani were destroyed by heavy rain, raging winds and rolling rocks. The structures are made of home-baked bricks and corrugated iron sheets. Homes of this type are a familiar sight across Zimbabwe, and are known for their resilience, but, in Ngangu, they were no match for a storm packing hurricane-force winds, pounding rain and mudslides. Jane Chitsuro, 42, miraculously survived but struggled to hold back the tears of loss. “I have no clue where my daughter is buried in the debris. There is no house left to talk about, no furniture, nothing to wear or cover oneself with. Only masses of broken bricks and rocks,” she said, her head wrapped in a bandage. Praise Chipore’s face is bruised and swollen the evidence in pain of what happened to her on Friday night. “A flood came and my house was destroyed and I was buried underneath it. My daughter who was with me on the bed was washed away from me and then a bigger flood carried me farther away,” said Chipore. 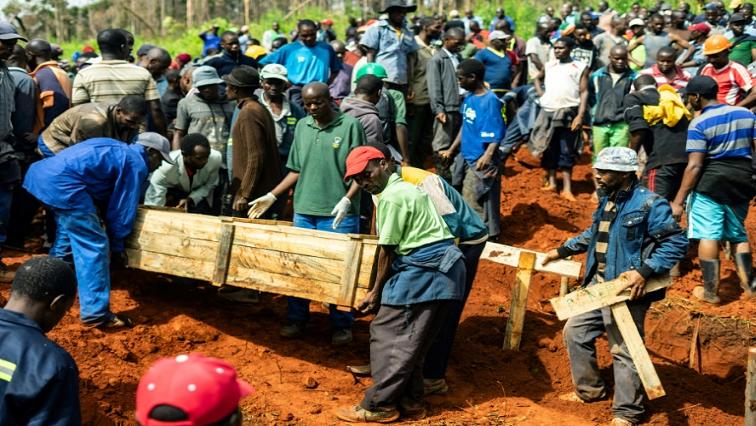 Grief pervaded the Chimanimani community on Monday as families started burying their dead in damp graves, with some family members sharing one grave. A tractor did several trips carrying coffins, fashioned out of crude timber by local woodworkers, to the burial site. The eastern district of Chimanimani was worst-hit, with houses and most of the region’s bridges washed away by flash floods. Some of the most affected areas are not yet accessible, and high winds and dense clouds have hampered military rescue helicopter flights. Two pupils and a worker at a secondary school in the area were among those killed after a landslide sent a boulder crashing into their dormitory. Soldiers on Sunday helped rescue the surviving nearly 200 pupils, teachers and staff who had been trapped at the school in Chimanimani. This entry was posted on 19 Mar 2019,06:38PM at 6:38 PM and is filed under Africa, Homepage Featured Story Slider. You can follow any responses to this entry through the RSS 2.0 feed. Both comments and pings are currently closed.